JOE GRIFFIN is the Communications and Policy Coordinator for Oklahoma. A native of Baltimore, Joe earned bachelor’s degrees from University of Maryland Baltimore County and Towson University. After college, Joe spent the early years of his career in TV news, reporting on crime and state and local politics in West Texas, New Mexico and Oklahoma. Joe went on to serve as the communications director for two Oklahoma Speakers of the House and worked as a media consultant for a number of political campaigns. 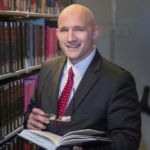 He is currently finishing his Juris Doctorate at Oklahoma City University School of Law and will take the bar exam in 2019.